Welcome to the new ProActive! I’d like to welcome you to the first of our new ProActive e-newsletters. Its purpose is to share short, bite-sized information to you—our busy employed members. It’s a chance to check in with your retirement system. We know for many Millennials and Gen Xers, retirement may not often be foremost in your thoughts. I’d like to encourage you to do a retirement estimate through the website on the left sidebar. This will help you evaluate where you are in your plan. If the results are not what you’d hoped, don’t get discouraged. What changes can you make to “right the ship?” It’s never too late, or too early, to save for retirement. We’ll be available between 10:00 a.m. and 3:00 p.m. to answer any questions you may have about either Defined Benefit or Defined Contribution Plans. There will be a short presentation the bottom of each hour with the rest of the time for Q & A. Bring your password if you’d like access your account with an ORS or Voya representative. 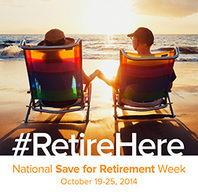 National Save for Retirement Week is a great reminder to review your retirement goals. Should you increase your contribution amount? Are you on target to retire when you’ve hoped? We’re here to help you make your retirement dream a reality. This service is provided to you at no charge by Michigan Office of Retirement Services.